In his book “The Geometry of Meaning”, Arthur M. Young developed a system which he called his “Rosetta Stone” because he claimed that it associated mental attributes to some physical measurements, giving a kind of map to mind-body dualism. 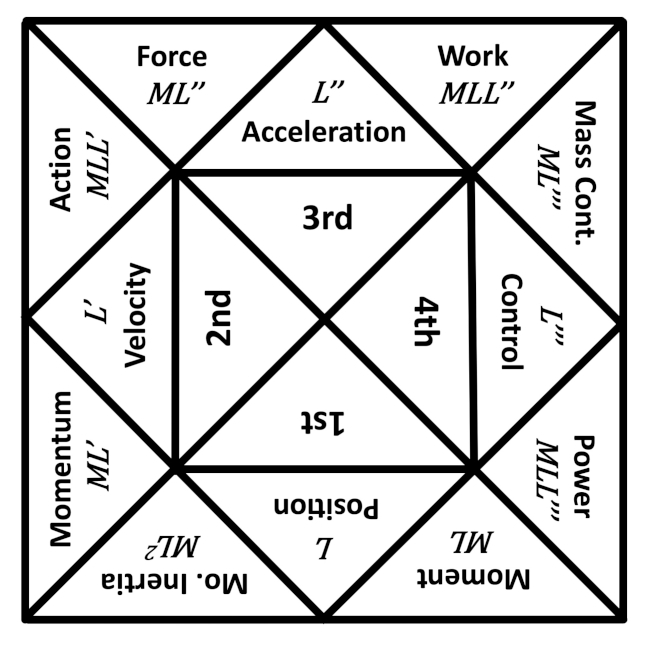 In the above diagram the expressions and names of these twelve objective values or physical units are shown. Examine the list below to see the twelve subjective values or mental attributes (shown in parentheses) that Young ascribed to them. I’ve rearranged the sequence of these somewhat because I don’t quite understand the reasons for the organization Young gave them. I’ve also relabeled the units using the more standard derivative notation L’ = dL/dT, L” = d^2 L/ dT^2, etc. His notation is given at the end of each line below in parentheses for comparison (essentially he removes the d’s from the derivatives, writing dL/dT as L/T, which seems confusing to me when then multiplied by L). Given the measurement Position or Length (L), Moment is Mass (M) times Position giving ML, and Moment of Inertia is Moment (ML) times Position giving ML^2. Velocity (L’), Acceleration (L”), and Control (L”’) have similarly related pairs of values by multiplying each by M and by ML. This gives four sets of similar expressions differing by their common derivative. I should have probably named the 1st set to be 0th, 2nd set to be 1st, 3rd set to be 2nd, and 4th set to be 3rd after the order of the common derivative. How does Young justify associating, for example, the mental attribute “Faith” with the physical unit “Moment of Inertia”? It seems to have something to do with his original cyclic order of these twelve measurements and the associations he gives them to the Astrological Signs of the Zodiac. This mapping is not shown but can easily be found in the links below. This entry was posted on January 27, 2019 at 12:50 PM and is filed under Arthur M. Young, fourfolds, sixteenfolds. You can follow any responses to this entry through the RSS 2.0 feed. You can leave a response, or trackback from your own site.